Over this past summer the Cremo Company, makers of Cremo Shave Cream, took a 1947 travel trailer refurbished into a “mobile barber shop” across the country to promote Cremo products and also to raise awareness of men’s mental health issues. I met them in Houston (covered on Sharpologist here and here) and it turned into a bit of a mutual-admiration society. I ended up working with them on a shaving video! I also got to meet some of the gang at West Coast Shaving…. Cremo shave cream has been on Sharpologist’s list of best shave creams since the article’s first edition in 2014: I think it’s one of the few good “mass market” brushless shave creams. And I knew Cremo was at least aware of Sharpologist–Cremo’s CEO Matt Biggins and I have occasionally exchanged emails over the years. I even helped test Cremo’s lathering shave cream when they were developing it. What I did not know was the extent of Cremo’s interest until I got an email from their Chief Marketing Officer, Jim Harrington, asking if I would like to meet the Road Trip crew during their stop in Houston (about 100 miles from me). Sure, why not? When we met I was in for a surprise–pretty much the entire Road Trip crew knew of me and Sharpologist: two public relations representatives, the Road Trip “personalities” (Faith and Edward), the videographer, even the driver. Matt and Jim weren’t there but Justin Bullock of Cremo flew out from Cremo HQ in California specifically to meet me. I was flattered, to say the least! During this meet-up Justin floated the idea of me working with Cremo on a ‘how to shave’ video for them. Would I be interested in coming out to California for a couple days (expenses paid) to shoot a video? Sure! And so in early December, 2018, my wife and I trekked out to California. We landed at John Wayne (Santa Anna) to avoid Los Angeles International airport (“LAX”). But there was a glitch with the rental car and by the time we got out of the airport it was rush hour…and dark…and raining! By the time we got to the hotel in Laguna Beach that Cremo put us in we were a bit frazzled. But on the plus side the rain cleared out the air and the next morning was beautiful. Our room was a block off the beach and there was some pretty spectacular views. Not much time to linger though, since it was video shoot day! We met the Cremo gang at a hotel near the Cremo offices. They had used the hotel before as a set for shoots, as someone discovered the bathrooms were big, attractive, and well-lit. Although I had been given an outline of the shoot previously it was apparent that some real thought and planning had gone into this: along with Justin and Megan (one of the PR rep’s I met in Houston) was a video director and a videographer working on getting everything set up (some other people came and went during the day, too, but I was busy and didn’t really get to meet them). The equipment they brought had my inner video nerd salivating. This was not the kind of “shoestring budget” video I was used to! We had a quick pre-production meeting on the day’s goals, then got to work. The first part of the shoot was me doing an introduction, and talking about the importance of knowing the beard’s grain, while I still had my (multi-day!) stubble on. Next the videographer and I worked on taking some generic footage (“B-roll”). I would point out, pick up, and put down various items. I also did things like turn the water on or off, load blade in a razor, and load cream onto a brush. All the while the videographer was getting footage from different angles. Then we moved on to the shave. 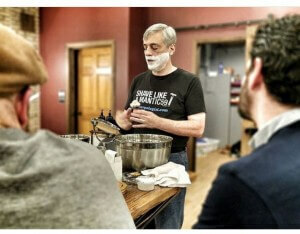 Yes, I really did do a multi-pass shave–this was not a “pretend shave” like some razor companies do! Although I used one of my own razors (a Feather AS-D2, chosen because I know it’s a mild shaver, unlikely to cause me trouble) I really did use Cremo’s Lathering Shave Cream and their (horse hair) brush. I lathered up several times so the videographer could get different shots. Time for putting blade to face! The videographer knew better than to try to get me to re-shave in exactly the same way multiple times so he shot different passes from different angles. Luckily the actual shave was shot without audio (“MOS”) so I wouldn’t have to try to talk (and make sense) while shaving. After shaving the videographer shot me finishing up and applying aftershave (yes, I really did use Cremo’s Post Shave Balm. The Cooling Post Shave Balm is in my rotation at home–I actually like it quite a bit). We stopped for a late lunch (and the Cremo gang presented my wife and me with a big gift basket full of products) then moved on to the next part of the production, the voice-over narration. Voice-overs aren’t as easy as they may seem. It’s more than just reading from a script–it has to sound natural and, well, unscripted. Here the director was instrumental in guiding me through the various takes (“you stumbled over a word.” “Try saying it another way.” “That sounded great!”). I was really impressed with the whole team and the results! I hope to work with Cremo again sometime in the future. Side Trip: A Trip To West Coast Shaving! By coincidence we were staying close enough to West Coast Shaving for a visit the following day. That would be a Saturday but I had gotten in touch with them beforehand to see about the possibility of stopping by (they’re usually closed on weekends). It was kind of a last-minute thing (I didn’t know our Cremo itinerary until late in the planning process) but WCS turned it into a mini wet shaving meet-up, notifying the local gang that I was coming! Abe and Kevin From WCS were our gracious hosts. The WCS office in Chino, CA is actually quite small: it’s mainly a “display” office and where they do their website photography and video. As it turns out most of their inventory is in a warehouse in Maryland for easier shipping. But there was still lots to see! They had a great selection of products to fawn over and Abe gifted me a new WCS shave brush (just recently launched. More information coming). We all had a great time. I hope to return for a longer visit!